The ruling Justice and Development Party (AK Party) held its third ordinary party congress on Saturday at the ASKİ Sports Hall in Ankara. by FATMA DİŞLİ ZIBAKUndoubtedly, the most striking aspect of the speech Prime Minister Recep Tayyip Erdoğan delivered during his party’s ordinary congress in Ankara over the weekend was his embracive discourse regarding figures and groups from different ethnic, religious and ideological backgrounds in Turkey. A speech delivered by Prime Minister Recep Tayyip Erdoğan at the third ordinary party congress held in Ankara on Saturday, in which he focused on his Justice and Development Party’s (AK Party) democratization initiative aimed at solving Turkey’s long-standing Kurdish problem, continues to echo in the Turkish media. There are signs of both hope and despair at the same time in Turkey’s political process. President Abdullah Gül delivered an exemplary speech last week aimed at compensating for the democratic deficit in Parliament, commemorating the new legislative year. A coup to gov't's Kurdish initiative came from the Religious Establishment (Diyanet). In some of the major Istanbul mosques, we have seen these nationalistic writings: "How happy is he who can say "I'm a Turk"!" Later last night, Diyanet stated that this was an attempt done by Istanbul Foundations Regional Authority without asking for permission from Diyanet. Let's what's going to happen. At a time when Turkey is for the first time taking concrete steps to solve its decades-long Kurdish problem, with the government working on an extensive democratization initiative aimed at re-creating an environment of solidarity and unity among the citizens of the country, unfortunate events which took place during a soccer match between Bursaspor and Diyarbakırspor on Saturday have led to great disappointment. Jailed PKK leader Abdullah Öcalan is appearing everywhere, like a UFO. (Click here for the last reported sighting.) 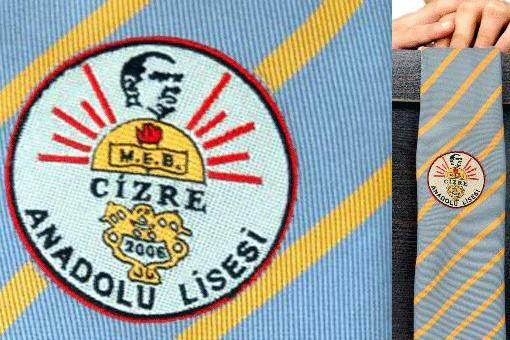 This time it?s the head of the Anatolian School in Cizre that is being investigated by prosecutors for having the likeness of Öcalan stitched onto the schoolboys? ties. The tailors that made the ties are also under investigation. (click here, in Turkish) Actually, it looks like Ataturk to me, but what do I know. Turkey ranks on position 79 in the UNPD’s Human Development Index. Concerning social gender equality the country slips down to rank 125. The per capita income is high but this is not reflected in the progress of community life. by RADİKAL YILDIRIM TÜRKERMost are unsure of the ages of those children. Most of those children live unrecorded lives and unrecorded deaths. Some say that Ceylan Önkol, a shepherd girl, was 12, while others insist 14.
by STAR BERAT ÖZİPEKA young girl named Ceylan was violently killed and the media, in shutting its eyes to this death, committed a crime. E. Tufan Aytav, in an article called ?Why the media showed no interest in Ceylan,? made an accurate list of the reasons for this temporary state of blindness on the part of the media. Because of missing voice records the 7th hearing of the Engin Çeber murder case had to be repeated. Detained defendants Karaosmanoğlu and Aksu reiterated their statements. Lawyer Tanay is concerned about a fair trial. Some crucial statements made in the previous session are still missing. The case is postponed till 16 November. Access has been blocked to LGBT social networking sites galibe, haydigayri and shemaleturk under accusations such as prostitution, obscenity or child abuse according to law article 5651. The site administrators were no informed about the decision and spoke of a “homophobic mentality”. A police officer from Avcılar (Istanbul) is accused of heavily assaulting university student Güney Tunay because he did not leave a park as ordered by the police. After Feyzullah Ete died in a similar incident two years ago, Tunay fighting for his life in hospital. Commissioner Thomas Hammarberg and his delegation visited Turkey from 28 June to 3 July 2009. In the course of this visit the Commissioner held discussions on certain human rights issues, including minorities, with national and local authorities, international and non-governmental organizations. The Commissioner held also meetings with institutions and representatives of minority groups. Turkey; country of prosecuted journalists and (6000 +) banned wed sites. The newspaper Radikal today reported the results of a poll regarding attitudes toward different others (non-Muslims, Kurds, Alevis, atheists) in Turkey (albeit without much information about who conducted it or how, so these results are not totally reliable. Nevertheless, they fit with what other polls have indicated). The results show a great deal of intolerance. Click here for the article. It?s in Turkish, but there are pie charts that are fairly clear. I?ll translate some more of the results over the next day or so. I have house guests at the moment and a heavy teaching schedule, so I?m unable to do it all at once. Who do you NOT want as a neighbor? More results from the poll I mentioned in my September 30 post, ?Perception Study on Views on Different Identities and Judaism?. It was sponsored by Turkey?s Jewish Rabbinical Foundation and supported by the European Commission. The poll measured attitudes toward different others (non-Muslims, Kurds, Alevis, atheists). The fact that it was sponsored by Turkey?s Jewish community has caused a great deal of discussion in Turkey, even though the poll results matched those of other recent polls of Turkish society. (eg click here for columnist Gila Benmayor). A lack of knowledge and prejudices rather than fact are the main influences of Turks’ perceptions of minorities in Turkey, according to a survey carried out earlier this year. by VATAN RUŞEN ÇAKIR Let’s touch on some of the ?indispensable? events that tend to mark Democratic Society Party (DTP) congresses. The fact that a group of DTP youths decided to protest during a speech made by DTP co-president Emine Ayna is quite meaningful. by YONCA POYRAZ DOĞANGülseren Onanç, founder and president of the Women Entrepreneurs Association of Turkey (KAGİDER), has said some civil society organizations in Turkey lack a humanitarian approach to the country’s long-standing Kurdish problem and instead stand behind an ideology — just like politicians. Lawyer Eren Keskin, actor Murat Batğı and writer Edip Polat were handed a 1 year prison sentence for using the terms “Kurdistan” and “Kurds”. Furthermore, they were deprived of all civil rights. Gültan Kışanak handed in a motion on the death of 14-year-old girl Ceylan Önkol. He questions issues such as why the prosecutor investigated the scene of the incident only after 3 days, why the post-mortem examination was carried out in the police station’s guardhouse and if any shooting happened at the Tapantepe Battalion on the day of the incident. Şırnak Prosecution Finally Looking for ?Death Wells? Next "'Privileged partnership' is an insult"